Soon it's the holiday season and most of us are going to be wearing different shoes or no shoes at all. For many of us this change will cause problems that we didn't have before. Painful heels when getting out of bed, painful balls of the feet when walking and tired legs at the of the day can all be attributed to inappropriate footwear or no footwear at all. By walking barefoot, you expose yourself to picking up a wart or a fungal infection. Also, the surfaces on which we walk barefoot at home or in the street, for example, are often too hard and flat and force our arches to flatten and our feet to roll over. Wearing decent leather shoes or sandals is the solution but they often lack support, leading to the painful conditions referred to earlier. 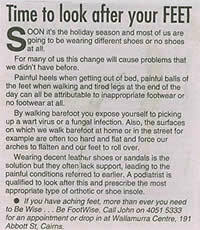 A podiatrist is qualified to look after this and prescribe the most appropriate type of orthotic or shoe insole. 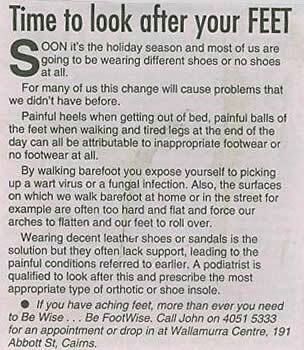 © Copyright FootWise Podiatry Centre 2005.